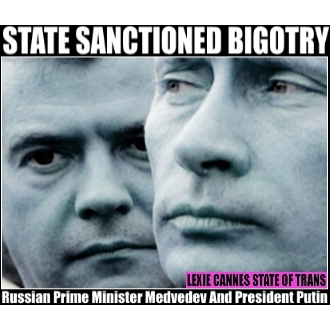 LEXIE CANNES STATE OF TRANS — Update Jan. 15, 2015: According to a report from the news agency Rueters, Russian officials are now saying trans people may still be able to drive — but this didn’t come down from Putin or Medvedev. Health Ministry spokesman Oleg Salagai said that the law only applies to ‘those suffering from chronic and prolonged mental disorders with severe or persistent symptoms’. An LGBT group spokesperson, Kseniya Kirichenko believes if that’s the case, psychiatrists would be the ones making the decision and he didn’t believe any Russian psychiatrist would deny a trans person driving privileges. I can’t tell if the Russians reversed themselves or if the new Russian law was too poorly worded for anyone to understand. Either way, things seem a bit brighter than they were a week ago for trans drivers in Russia. Original article Jan 10, 2015: Yup, you read that right. If you’re transgender, you can’t drive in Russia. A new “road safety” law classifies trans people as having ‘medical disorders’ and are therefore barred from driving in Russia. The regulations were signed into law last month by Prime Minister Dmitry Medvedev, and course, nothing in Russia happens with President Vladimir Putin’s approval. While there’s no doubt some Russians stand with us, but the fact of the matter a large percentage of Russians approve of state sanctioned bigotry — last year’s anti-trans legislation was the first indication of that. Putin’s sky-high approval ratings gives insight into the minds of many Russians. Any leader of a western nation signing off on such ridiculous legislation would face an uproar from a huge percentage of the population. In Russia, not so much. Sanctioned bigotry rules over there, enabled by by the Russian people. Transphobia of the highest order. PARA CONDUCIR Y MUCHAS COSAS MAS, SOMOS BUENAS NOSOTRAS LAS MUJERES TRANS. SALUDOS A TODAS MIS AMIGAS. Let’s band Russians from traveling abroad so they don’t risk getting infected by liberal ideas! Law enforcement don’t listen to the Health Ministry. They follow the letter of the law. While spokespeople may be accurate that psychiatrists won’t deny driving privileges, they won’t have to. Law enforcement will still use it as an excuse to pull over, arrest, or just simply beat the trans person while saying “mental disorder with persistent symptoms” as they do.